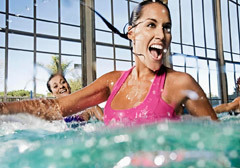 Splashing, stretching, twisting—even shouting, laughing, hooting, and hollering are often heard during an Aqua Zumba ‘pool party!’ Aqua Zumba integrates the Zumba formula and philosophy with traditional aqua fitness disciplines for a safe, challenging, water-based workout that’s cardio-conditioning, body-toning, and exhilarating. So accept the invitation to get your heart pumping, and come stretch and strengthen with us! Be sure to eat only a light snack in the two hours before class.